Well, you can say that, but it probably won’t do any good. To view your current location, tap the Location icon. 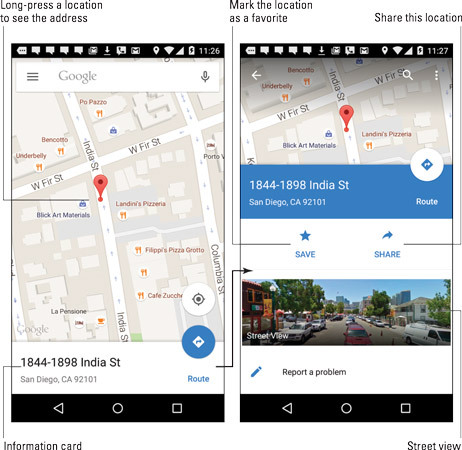 If you desire more information, or if you want details about any random place, long-press the Maps screen. Up pops a card. The card gives your approximate address. Tap the card to see a screen with more details and additional information. This trick works only when Internet access is available and the Maps app can communicate with the Google map servers. To make the card go away, tap anywhere else on the map. For nearby locations, the Route icon shows a method of travel and an approximate time value for the trip duration. When you have way too much time on your hands, play with the Street View feature. Tap that item on the location’s card to examine a location preview with a 360-degree perspective. It’s a great way to familiarize yourself with a destination or to plan a burglary.